Pro Tools | Avid Link App Brings A Unified Way For Users To Suggest Pro Tools Feature Requests to Avid. Will You Use It? Avid Link App Brings A Unified Way For Users To Suggest Pro Tools Feature Requests to Avid. Will You Use It? Until recently there has been a number of different ways Pro Tools users could send feature requests to Avid. With recent changes and developments, the good news is that with the new Avid Link app, which is currently in public beta, Avid Link is being developed to simplify these routes and deliver a unified interface that enables users to not only submit feature requests and other insights but also to be able to manage their applications, purchase products and plug-ins, and connecting with the Pro Tools community. Avid invites you to share your ideas for new Pro Tools software features. Please visit the link below to submit, comment, and vote on Pro Tools features submitted by our users. You can easily register and then you will be able to submit new ideas. And of course, comment on or vote for the ideas you see proposed by others. We look forward to using this new tool to get even greater visibility on your needs for the future! The Pro Tools Ideascale was also the place to report bugs and other issues as well as make feature requests. Avid today announced the creation of the Avid Customer Association, a comprehensive initiative designed to provide essential strategic leadership to the media industry, collaborate with key industry leaders and visionaries and deepen relationships between the company and its customers. The multifaceted program will engage its network of broadcast, creative and media customers, and other industry leaders, in a highly collaborative process to provide both strategic leadership and cutting-edge technology solutions to address the most important issues facing the media industry today. In December 2016 Avid launched their first annual ACA votes. The model was a two-stage process with round 2 taking place in February 2017. Round 1 allowed ACA members to choose new feature options from a long list, and then in Round 2 ACA members voted again from a short list of the most popular features from round 1. With the launch of the ACA votes, Pro Tools users had at least 3 different places through which we could feedback feature requests to Avid, the Pro Tools Ideascale, the ACA forums and the ACA surveys. But which one to use? Which would Avid take most notice of? It wasn’t clear and nobody was sure. At IBC 2018 in Amsterdam Avid released the public beta of the replacement to the Avid Application Manager, which hasn’t been well received and has given users issues that have slowed up their computers. To help, we produced an article showing How To Stop The Avid Application Manager From Launching At Startup - Mac And Windows. Avid Link is a free new app that is available for Windows, macOS, iOS and Android, Avid Link has been designed to make it easy to find, message, and collaborate with other creators, promote your work and skills, manage your Avid account, and purchase software, hardware, plug-ins, and other tools to advance your creative capabilities. 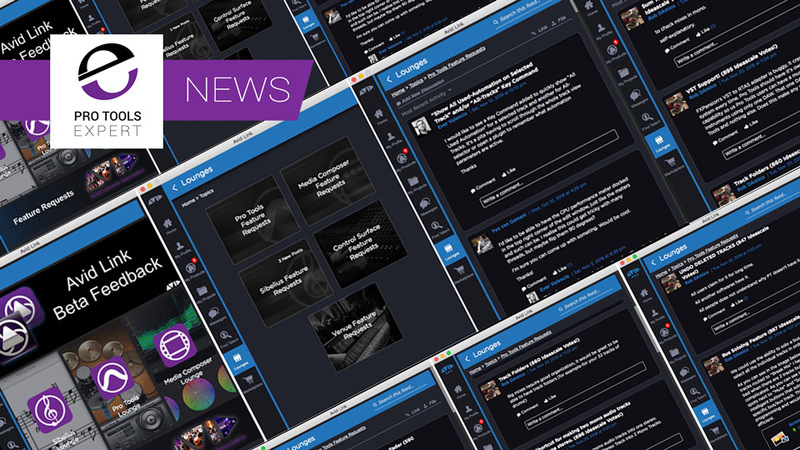 If you want to learn more about the Avid Link app then check out our news article. Less than a week after announcing the Avid Link public beta at IBC 2018 in Amsterdam, Avid announced the closure of the Pro Tools Ideascale. On September 26th 2018 Avid sent out an email to Pro Tools Users giving some more information on how we can submit Feature Requests using the Lounges section of the new Avid Link app. At Avid, we understand the value and importance of capturing ideas and feedback from our community and strive to collaborate on innovative solutions and capabilities for future releases. In reviewing the multiple platforms used to collect feedback with the goal of optimizing the process for everyone we have decided to retire our IdeaScale communities effective September 27, 2018. During this transition, we encourage you to continue discussing your feature ideas in our communities and social channels. We are also in the process of adding a new Lounge called “ACA Feature Requests” within our Avid Link application, so you can give us your feedback any time throughout the year, for any of Avid's core products. Please join the Public Beta now and be ready when this lounge becomes available by the end of September. Also, as part of this transition, we plan to import many of the most popular existing feature requests from IdeaScale into our annual ACA Vote at the end of this year. We look forward to having you continue to share your insight and ideas. ﻿Well, it seems that Avid has heard us and taken steps to reduce the confusion about which way to submit feature requests. With the launch of the public beta version of the new Avid Link app, intended to replace the Avid Application Manager, and the closure of the Pro Tools Ideascale, Avid has had a rethink on how users make feature requests and we can announce that the plan for feature requests will now work like this. The key point is that the Avid Link app becomes the one-stop place to submit all feature requests. You now submit feature requests using the dedicated Feature Request Lounge in the Avid Link app. These suggestions can be voted up and commented on just like we could in the Pro Tools Ideascale. Avid have just added ability to sort by number of “Likes” in lounges, so you can see which are the most liked ideas. We have also suggested that there should be a thumbs down option to replicate the feature to both vote up and vote down ideas that we had in the Pro Tools Ideascale. It also means that if you want to submit feature requests to Avid as well as comment on other feature requests you will need to download and use the Avid Link app. There is now no other way to submit feature requests to Avid. These user-generated suggestions will then form the basis of the annual ACA Vote, which will be voted on as before and then the most popular feature requests will be scheduled into the Avid roadmap for Pro Tools and other Avid products. The outcome of all this means is that new feature ideas for Pro Tools will be mainly driven by customer requests and that has got to be good news. What Will Happen To The Feature Requests Left In The Pro Tools Ideascale? It wasn’t clear how the feature requests and the current top 10 from the Pro Tools Ideascale would be migrated into the Pro Tools Feature Request lounge in the Avid Link app, but Rob D’Amico has now copied them across to the Avid Link, so it would be worth ‘Liking’ them in the Avid Link lounge. If there any feature requests that matter to you from the Pro Tools Ideascale we recommend that you copy them across to the Pro Tools Feature Request Lounge in the Avid Link app. Are Avid Becoming More Customer Focused Under The Leadership Of Jeff Rosica? There is a very clear shift in Avid’s direction and I believe this is down to the leadership of the new CEO and President of Avid Jeff Rosica. As well as announcing the 1 millionth download of their First free apps at IBC 2018, Jeff hosted a press event which I attended. At this event, Jeff reiterated the demands from Avid’s customer base are for lower costs, simpler integration, faster deployment and easier to maintain systems and technical environments. The theme of the whole event was Avid becoming must more customer focused. It was also interesting that for this event Avid chose a more informal setting, with no technology, no presentations, no slick videos, just a passionate man wanting to share his vision for the future. With the new Avid Link app, we now have a single easy way to provide Avid with feature request suggestions that will feed the ACA Vote so that the features being voted on by users will have come from users in the Avid Link Feature Request Lounges and voted on again in the ACA Vote by the community. Don’t forget that there is a lot more to the Avid Link app than submitting feature requests including manage your Avid applications, purchase products and plug-ins, and connecting with the Pro Tools community. What do you think about this new route of a simplified way for Avid to receive feature requests from users that will feed into the AVA vote? Will you be engaging with this new process? If not do tell us why not. Nugen Audio Running A Second Music Streaming Service Survey - Can You Help? Pro Tools Expert Reader - Do You Use Pro Tools?